The church of La Merced is one of the most distinctive in Antigua. Its history is strongly marked by earthquakes. Originally built in the mid-sixteenth century, it was destroyed and rebuilt several times until assuming more or less its present shape in the eighteenth century. Perhaps its most striking feature, its churrigueresque facade, was added in the nineteenth century. But this post is not about the church — I will save that for another time. 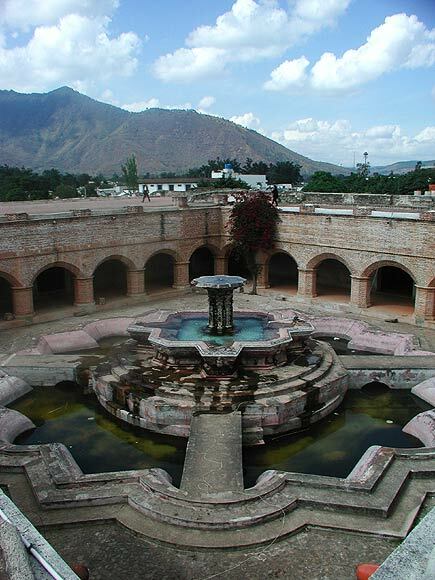 This is about the fountain in the adjacent courtyard. Called the Fuente de Pescados, it dates from the eighteenth century; it was restored in 1944. 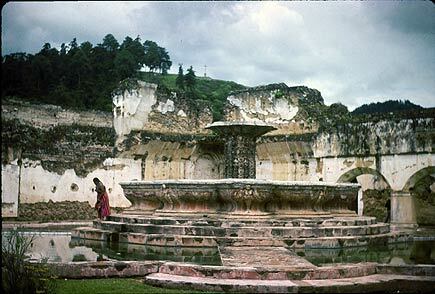 Twenty-seven meters in diameter, it’s said to be the largest classical fountain in Guatemala, or in Central America, or in Latin America — it doesn’t really matter. The fountain is in the shape of a water lily. Water lilies are more common in the lowlands, in which bodies of water tend to be still or slow-moving, than in the highlands. In Maya symbology, the water lily, perhaps as a result of the way it seems to emerge out of the watery depths, is associated with creation. A Lancandon legend says that the first god created a water lily, from which all the other gods emerged (Miller and Taube, The Gods and Symbols of Ancient Mexico and the Maya). I took the picture at the top of this post some three decades ago. Compare it to the following one, which I took about five years ago. Here you can see that the surrounding arcades have been completely restored. The stucco-like surface has been replaced with brick. It’s not an unpleasant change, and now one can walk all the way around the courtyard, looking down on the fountain from many angles. Still, the romantic quality of the ruins in the first photo brings a wave of nostalgia. I feel fortunate to have been among the last to see the fountain in this form. I don’t know when this latest restoration occurred, but I suspect it followed the massive earthquake that struck the highlands just a few months after the first picture was taken. Nothing is permanent in Mesoamerica, where Christian churches are built on the foundations of ancient temples, and the earth itself rearranges the surface of things at frequent intervals.